Find Shadows in the Curtain - Amazon * Goodreads - Free if you have an Amazon Prime account. 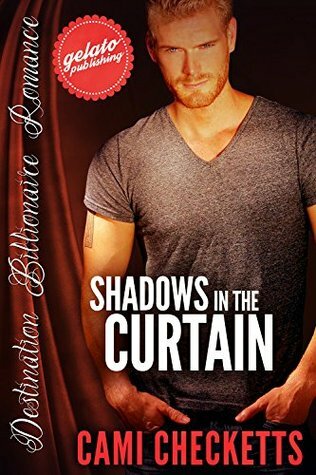 I'm thrilled to announce the re-release of Shadows in the Curtain with Gelato Books. I love that cover! He looks so much like Josh to me. "Here's the thing.Cami Checketts knows how to write a good book. She knows pacing and tension andlove. She brings those things together in such a fabulous way that I literallydevour her books. Can't put them down, so bummed when they are over kind ofdevouring. The characters are real and believable and you connect to them, feelwith them. Cami is one of my favorite romantic suspense authors and I am always so excitedwhen I see she has a new book coming out. This was probably one of my favoritesso far. It was a good, clean book and a great diversion for my brain.Yay!" "Emmy is such a sweet woman. She is very loyal to those she loves and is dedicated to her work. She is a very talented actress, but instead of focusing on fame and fortune, she seeks love and happiness. Emmy really has her priorities in line. I enjoyed the friendship she had with her neighbors, especially Kelton. I loved the suspense and mystery. I thought it was well-done in a way to keep the reader engaged and invested in the story. The romance was sizzling, but clean, and for me (a clean romance lover), that kept me flipping the pages. The characters were well written and the mystery kept me guessing. I loved the setting--I love the ocean and would love to have a house in a place like this one (small town Oregon)!"